New tabs on the Tab bar are normally created/opened at the extreme right position. This option, when checked, forces new tabs to be created to the immediate right of the active tab. This position for the tab is used even if the tab is created by a non-active tab elsewhere on the Tab bar using the Context menu, for example. When this option is enabled (ie. checked), tabs may be closed by double-clicking on the tab in the Tab bar. 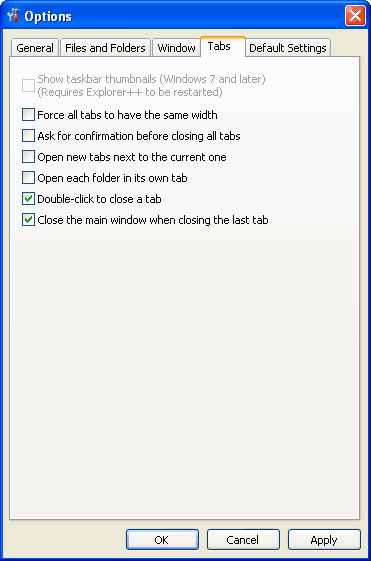 If disabled, the tab must be closed by an alternate method, such as the Tab bar’s close button. Explorer++ usually disallows closure of the last open tab, but with this option enabled, this can be done, and results in Explorer++ closing completely. With this setting active, you cannot use the close button on the Tab bar; you must use double-click (subject to option), a key combination (Ctrl+W, Ctrl+F4), or a menu item.